In recent years, 40% of Putter’s Edge installations have been putting green facilities for commercial clients. Our 10-year turf and base warranty provide our commercial clients peace of mind, knowing they have a virtually maintenance free putting greenthat will provide years of enjoyment to all. Two commercial markets that Putter’s Edge has developed a strong relationship with are Retirement & Nursing Facilities and the Golf Instruction industry. Putter’s Edge is one of few putting turf companies that construct our installed putting greens to meet the standards of the ADA, providing Handicap Accessibility. Because our PAR Turf™ putting green surfaces don’t utilize sand in-fill, and our synthetic turf surface is glued to a concrete-like base, wheelchairs can utilize 100% of the putting green area. And that benefits you, as well. 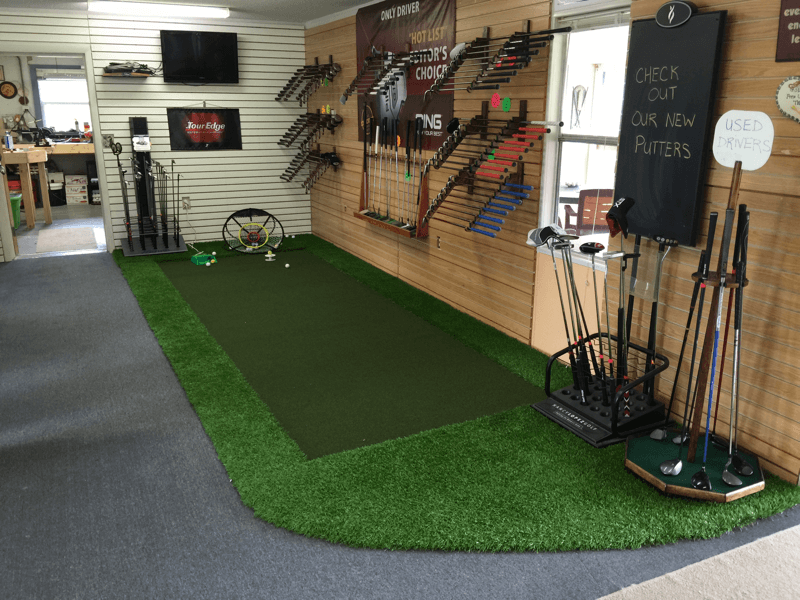 Make Putter’s Edge your Synthetic Turf Supplier. Residents in over 150 retirement & nursing facilities are enjoying our putting greens with family and friends that visit them. Physical Therapy utilizes the putting green to help improve patients’ motor skills. A putting green that is customized to meet ADA Standards, requiring virtually no maintenance and is an affordable facility enhancement. A natural market for Putter’s Edge putting green turf has been golf professionals and golf instruction schools in the US & Canada. The stimp speed of greens varies throughout the country. We provide putting turf that matches the local putting greens of teaching professionals, making Putter’s Edge PAR Turf the perfect fit. Dozens of successful Universities and High School golf programs have also taken advantage of the turf to improve their short game. You can read what they say about our putting greens on the testimonials page. Another commercial use for putting greens comes from the corporateworld, both as employee benefits, and in the Hotel service industry. By adding a golf practice facility complete with chipping and sand trap areas, savvy managers can upgrade their value to the people they depend on for their success.What better way to spend an afternoon mulling over business ideas than relaxing on a custom Putter’s Edge putting green installation? We may be biased, but our customers tell us it works. Our TEE-LINE is The “Best” Golf Mat Material Made! It can be made in to mats or wide strips for entire ranges. It will hold a tee for wood practice.